Clinton A. Sanders, RLS founded Land Development Group, Inc. in 2009. Clint received a Bachelor's Degree from Murray State University in 2005. 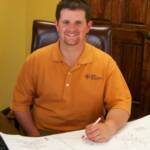 Clint has over 8 years of land surveying & land development experience with other firms. Adam Ledsinger, P.E. joined Land Development Group, Inc. in 2010 and is currently serving as the Engineering Department Manager. He oversees all Land Development Group, Inc. engineering projects. Adam received his Bachelor's Degree in Civil Engineering from Tennessee Technological University in 2002 and has been a licensed professional in Tennessee since 2007. Adam has previously worked in both public and private sectors on a wide variety of civil engineering projects. Jason Britt has been with Land Development Group, Inc. since the beginning. Jason has received a Bachelor's Degree from Bethel University and is currently pursuing licensure for Land Surveying. Jason brings several years of experience of construction layout, drafting & large tracts along with a great understanding of land surveying & land development. Ultimately, our goal is to produce high quality surveys. We offer a wide range of surveying & development services - from planning and development, through design and construction documents, to on-site inspection. Each client receives one-on-one attention through the entire process from at least one of our highly skilled personnel.